"Choose Life" has a simple message with an even simpler goal-- sell license plates to fund pregnancy crisis centers across America. President and Founder Randy Harris started the campaign in the 90's. Florida was the first to sell the license plates with Governor Jeb Bush signing the legislation in 1999. Since then the state has sold over 338,221 plates, raising more than $7.7 million to talk women out of having abortions. Half of the United States are already selling the license plates. 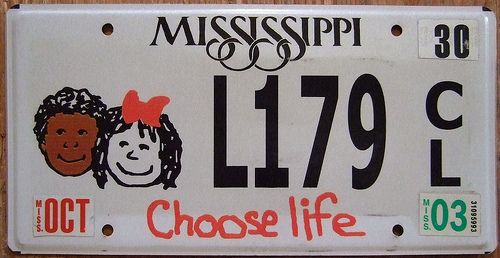 Last week, North Carolina joined the list of states where the "Choose Life" license plates are available. For an additional fee of $25 at the DMV, residents can tell the world they're anti-abortion and $15 will go to the state's pregnancy crisis centers. 14 yr old; had ultrasound; is 18 wks; is being pressured by her mother to have an abortion even though she does not want to do this; she said her abortion is scheduled for this Monday or Tuesday; please pray the image of her baby and the message she received with us will touch her through the Holy Spirit. Funding supports religious institutions imitating medical establishments. These "health centers" refuse to discuss abortion as an option. If a woman mentions she is considering terminating her pregnancy, volunteers (not nurses or doctors) will try to talk her out of it with an ultrasound and "abortion consultation," which could also be described as guilt, intimidation and misinformation. Woman had ultrasound appointment; declined to come back; had abortion consultation this past Saturday; please pray she will call or come to our office for assistance. Assistance means convincing her not to go through with it-- because a woman's choice shouldn't be respected. One of the biggest decisions of her life should be left up to a bunch of strangers. And the first place she should go for reproductive help is a fake medical facility full of lies and manipulation. It's completely unnacceptable that half of the United States are allowing money from a mandatory government procedure to be siphoned off for these Pro-Life endeavors. Pregnancy crisis centers, no matter what name they're operating under, are dangerous and should be illegal. And they certainly shouldn't be receiving any financial support through the state-- especially when Planned Parenthood and people who tell women the truth are being stripped of their funding.